Tuft & Needle is one of the more intriguing bedding companies to emerge in the last few years. 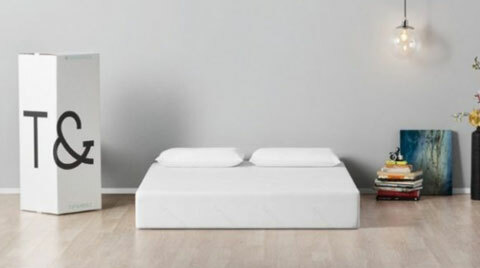 The mattress is composed of a foam they have named simply “T&N Adaptive”, This startup company out of Arizona has created a simple, no nonsense sleep solution that is delivered to your door at a reasonable price. The company’s last few years have been quite eventful. Today, these beds are available direct from Tuft & Needle, Amazon, or home improvement giant, Lowes. The merger of a Phoenix-based online mattress marketer with the nation’s largest bedding manufacturer has sent shock waves through the industry. Serta Simmons is one of the world’s most recognizable brand names. Tuft & Needle Co-founders JT Marino and Daehee Park have built their company into a 170 million dollar a year business in just 6 short years. Their partnership represents an industry milestone. 20% of all mattress purchases are now made online. With many of the nation’s largest bedding retailers struggling to keep pace, the merger makes a lot of sense. Park and Marino will assume roles in company’s management team. Their focus will be expanding ecommerce operations. Tuft & Needle offers a solid value at a reasonable price. The cover is a 40/60 blend of micro polyamide and polyester and polyester. This fabric is designed to prevent moisture build up and sleep cool. T&N Adaptive: (3” of 2.9 lb density) While more supportive foams are available, this is a quality foam for the price point. T&N is polyurethane based and designed to “adapt” to different body types and sleep preferences. The objective was to produce a foam that has the bounce of latex with the pressure relief of memory foam. Meanwhile, heat wicking graphite and cooling gels help regulate sleep temperature. Support foam: This 7” bottom layer of 1.8 lb. density foam provides stability for the comfort layer. A quality base is essential to overall support. Combined with T&N Adaptive, most sleepers will find adequate support. We had several people of various body types lay on this mattress. While Tuft & Needle performed quite well for most, larger individuals (those over 250 lbs) tended to bottom out a bit on this mattress. Still, not bad for its 10” profile. This mattress has a buoyant feel. It’s pressure relieving but with a bit more bounce than memory foam. Great motion transfer reduction. A plus for couples. While movement is not as easy as some innerspring or all latex beds, it’s an improvement over memory foam. This new innovative process reacts differently than traditional foams. T&N Adaptive was created to be less heat retentive than either memory foam or latex. It’s worth noting, all foams retain some body heat. Some just do a better job than others of dispersing it. Consumer feedback seems to indicate the Tuft & Needle mattress sleeps reasonably cool. That said, there are new memory foam options that sleep far cooler than years past. New technologies offset earlier heat retention issues that plagued the industry for years. While T&N Adaptive may perform as well or even better than many synthetic foams, natural latex is still the coolest sleeping foam option. This bed is CertiPUR certified to not emit dangerous chemicals into the air. Only a slight “new” odor was detected that dissipated quickly. We have some concerns after seeing how this mattress gave way to larger body types. However, our research was not able to uncover significant complaints as to its durability. The company is only 6 years old so additional time may be needed for a fair evaluation. Like memory foam, this is not a strong suit for T&N. 100 night sleep trial is the norm for most online mattress companies. Shipping is free to your door in the continental U.S.
Movement is easier than on a memory foam bed, with a bit more bounce. This mattress is an exceptional value for the dollar. its low price make the Tuft & Needle a great buy. Although designed to provide adequate pressure relief for side sleepers, this mattress might be a bit too firm for those who prefer a softer feel. Most back sleeper will appreciate this bed’s medium firm feel. Proper alignment is created with decent pressure relief and conformity. Heavier individuals may experience more sinkage and require more support for proper alignment. This mattress is designed to have that universal medium firm feel. It will be soft enough for most but not all side sleepers. Those seeking more hug and body conformity will find this mattress too firm. Stomach sleepers need a mattress that does not allow their lower backs to dip and cause lumbar pain. Those looking for a little more bounce and buoyancy opposed to sinking into their bed will appreciate Tuft & Needle’s firm but not too firm feel. Low Motion Transfer: Our evaluation found little to no motion detection. This is a solid benefit for couples. Sleeps Cool: Cooling gels and graphite infused foam regulates heat. Great Value: At a price of $595 for a queen mattress, Tuft & Needle is a great value. Only One Firmness Option: This mattress will accommodate most but not all comfort preferences. Support may not be suitable for larger people. Bigger body types may not find sufficient support. If you want to sleep cool, heat regulating technology keeps you cool and comfortable. If you’re looking for an affordable memory foam mattress, Tuft & Needle offers good value at an affordable price. People in search of a very soft or very firm mattress will most likely fair better with other options. This mattress falls right in the middle. Those seeking significant edge support should stick with an innerspring mattress. Like memory foam and latex beds, Tuft & Needle’s edge support is fair at best. Larger individuals should seek more supportive options. At 72 lbs, this mattress weighs much less than many comparable options. One person could handle this bed by themselves. However, it’s still easier with 2 sets of hands to assist you. Tuft & Needle is a well-priced mattress that delivers decent quality. For those on a budget, it’s money well spent.